Load the power of Littlestone Ammunition for self-reliant confidence in your .44 Remington Magnum revolver. These 20 rounds of custom-quality Littlestone Ammunition launch a 240-grain Speer Gold Dot Deep Curl Soft Point bullet at a muzzle velocity of 1,420 fps and it packs 1,075 ft lbs of energy. Gold Dots are bonded Uni-Cor bullets, in which the jacket is built up on the lead core chemically, one molecule at a time, rather than being put in place mechanically, which can lead to jacket/core separation. The bonding process virtually eliminates the possibility of jacket/core separation. The soft point version of the Gold Dot is a good choice when deeper penetration is required. It typically retains about 95% of its weight through impact. Finding that load can be expensive if you have to buy a full box of 20 or 50 rounds for every type you want to try. Which is why we developed our sample pack system. With one purchase of 20 or 50 rounds, you can test either two or four different loads, helping you find ammo that meets all your needs much more economically. After you test one or more sample packs, if you and your gun like the load, come back and purchase it in greater quantities. 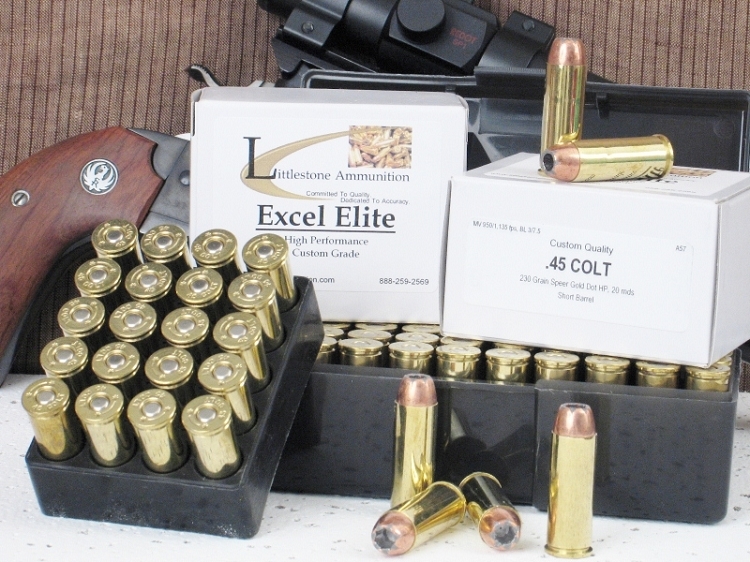 Of course, if you prefer, use the Add To Cart button above to purchase this 20 rounds of Littlestone Ammunition now. Feature 3: MV / Energy / Barrel: 1,420 fps / 1,075 ft lbs / 7.5"